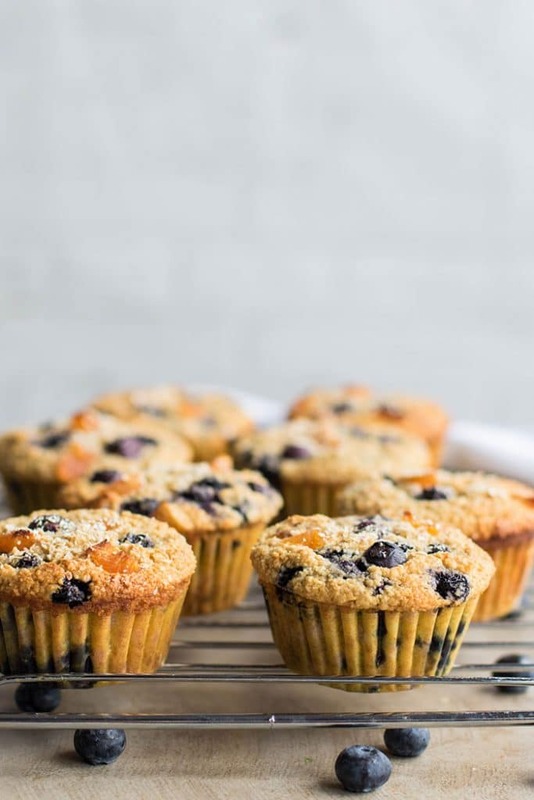 These Blueberry Apricot Oat Bran Muffins are the best muffins I have ever made. I was pleasantly surprised at how soft and moist they turned out with the main ingredient being oat bran. I packed these with blueberries and dried apricots, but there are so many options for what to do with these beauties! Remember those giant Costco muffins everyone ate back in the 90’s? My high school sold them at our snack stand, and I often bought a double chocolate muffin and a Pepsi instead of a real lunch. I am still in shock when I think about the types of foods that were offered to us when I was in school. Most kids just don’t know about nutrition and food to make these types of decisions on their own, and spending lunch money on a candy bar, bag of chips, or sugary muffin, is just too tempting! I do believe this is changing in most schools, but maybe not fast enough. I remember thinking my muffin was actually a good option. Maybe not the Pepsi, but a muffin? A healthy breakfast, so okay for lunch, right? I cringe now thinking about biting into one of those sugar bombs. I may be healthy now, but at the time, I wasn’t, and I’m sure having access to all the junk I did at school didn’t help. 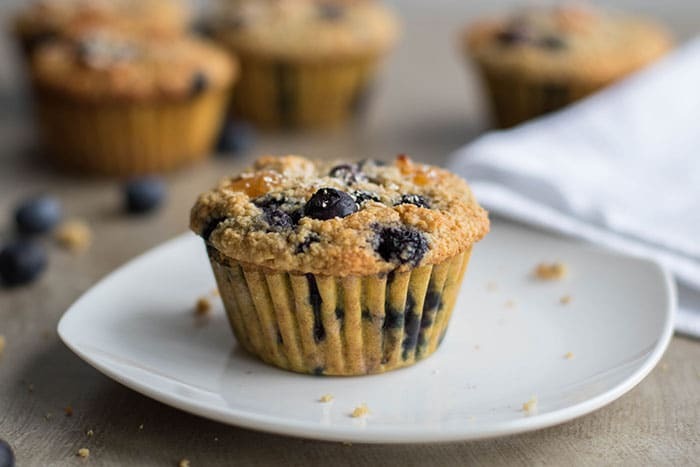 If you still pick up giant muffins at coffee shops, here are some general stats: 690 calories, 48 grams of sugar (more than a can of Coke), and only 3 grams of fiber. These gems are smaller (that’s a good thing, in this case! ), but they only contain 200 calories, 11 grams of sugar, and have 3 grams of fiber and 5 grams of protein. The high protein and fiber in this recipe is due to the oat bran, and some of the sugar is from the yogurt and the fruit. I started this recipe by lightly adapting the Quaker Oat Bran Cereal muffin recipe, which was just oat bran with sugar and the wet ingredients. I took out the sugar and just used the honey, and then decided they were a bit too dry, so I subbed some of the oat bran for almond flour and added a little arrowroot powder because I love how it helps the texture of baked goods. My second attempt was perfect. These are by far my favorite muffin recipe now. I will certainly be making more variations soon! Change it Up: I made these with blueberries and dried apricots, and it was a really fun combination. However, feel free to use just blueberries, or sub fresh apricots for the dried. These would be wonderful with any berry, or even some mashed banana. Let me know if you try a variation! Make it Gluten Free: If necessary, be sure to use Certified Gluten Free Oat Bran cereal. Make it Dairy Free: Feel free to sub a vegan yogurt in place of the yogurt in this recipe. Although I haven’t tried it, I bet a mashed banana or applesauce would work as a sub. Preheat oven to 425 degrees F. Add 9 liners to a muffin pan. Add oat bran, almond flour, arrowroot powder, baking powder, and sea salt to a bowl, and stir to combine. In a small bowl, mix together almond milk, yogurt, egg, honey, coconut oil, and vanilla. Stir well to combine, and then pour into dry ingredients. Stir just enough to wet dry ingredients, and then fold in blueberries and chopped apricots. If using frozen blueberries, add while still frozen. 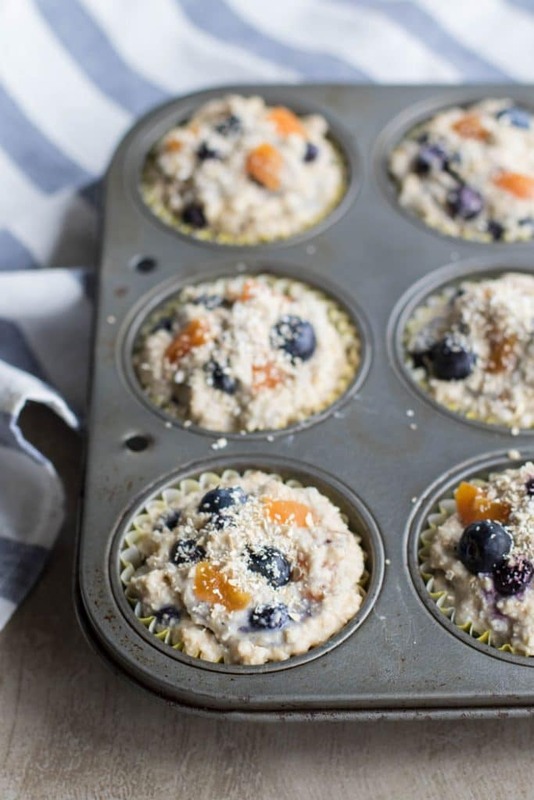 Fill muffin cups to the top. These muffins do not rise a lot. I overfilled mine and got 8 muffins, but you can get 9 if you just fill them to the top. If using frozen blueberries, bake for 16-18 minutes. 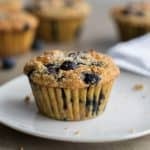 If using fresh blueberries, bake for 14-16 minutes, until tops are golden brown. I couldn't believe how amazing these turned out :) Oat bran always surprises me with how good it is! Have you ever used it like instant oatmeal? I use it when I am traveling-- put oat bran, seeds, dried fruit, in little ziplock baggies, and it makes the best on the go breakfast or snack when out and about. These oat bran muffins sound (and look) wonderful. 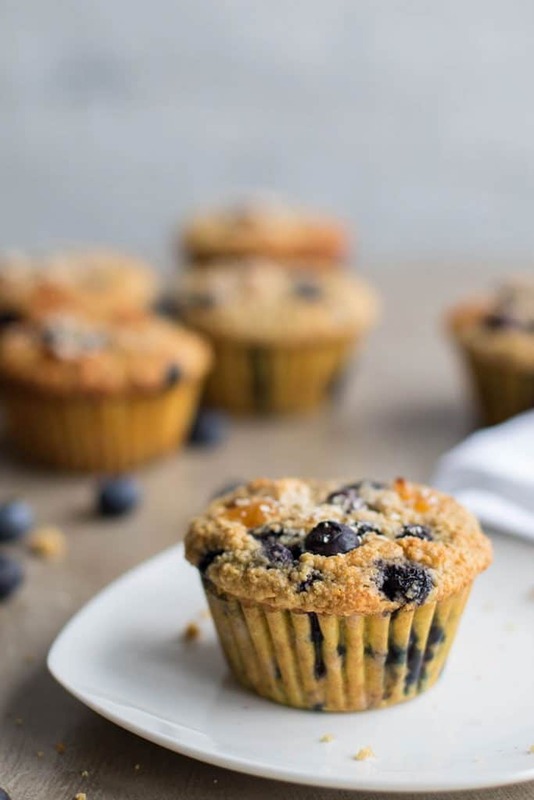 I love blueberry in muffins and love that there is no refined sugar in there... surely that means I can eat 5 in one sitting right?! With the fiber and protein in the oat bran, these truly are so healthy! I have been known to eat more than 1, for sure! I give them to my toddler for dessert. Oh man these look delicious, love the flavours in them too. Thanks Brian! It was a great combo. I can't believe these are flourless. I could eat them every morning. How long do they keep for in the fridge? I was surprised at how dense and chewy these were -- not crumbly or "airy" at all like some gluten free muffins are -- I really recommend these! We have never had them more than 4 days in the refrigerator, but they still tasted fresh, so I am pretty sure they would be fine up to a week in the refrigerator. If you are making them for yourself and need them to last longer, just freeze, and then sit out to thaw or heat up when you're ready to enjoy one :) I am thinking if you kept them frozen in individual bags, it would be a great travel snack or work snack to grab out of the freezer in the morning. Delicious! I could eat these for breakfast every day. I love using almond flour in recipes. This one sounds and looks delicious. I bet it's nice and filling too! Almond flour is just so delicious! I always think I should not include it in some of my baked goods, but it always seems to be the answer when a recipe isn't quite good enough. I tried to make these with just oat bran and oat flour at first, but I wasn't 100% happy until I swapped in the almond flour! These are a great option if your wife is trying to lose weight-- the oat bran is so high in protein and fiber, and pretty low in calories, compared to other flours. They are so filling! Thanks for stopping by again, Brian! PS-- did you get my reader survey email? I reached out last week to get feedback from a few readers who comment regularly, and since you're the only male who regularly reaches out to me, I'd really love your feedback on some improvements to my site and products!